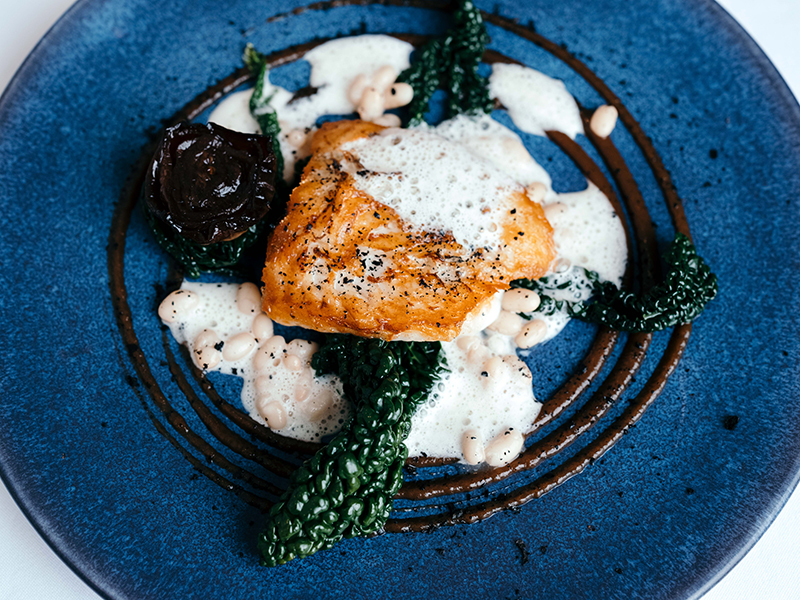 This month Platinum talk to Will Holland, Executive Chef of the stunning Atlantic Hotel on Jersey. 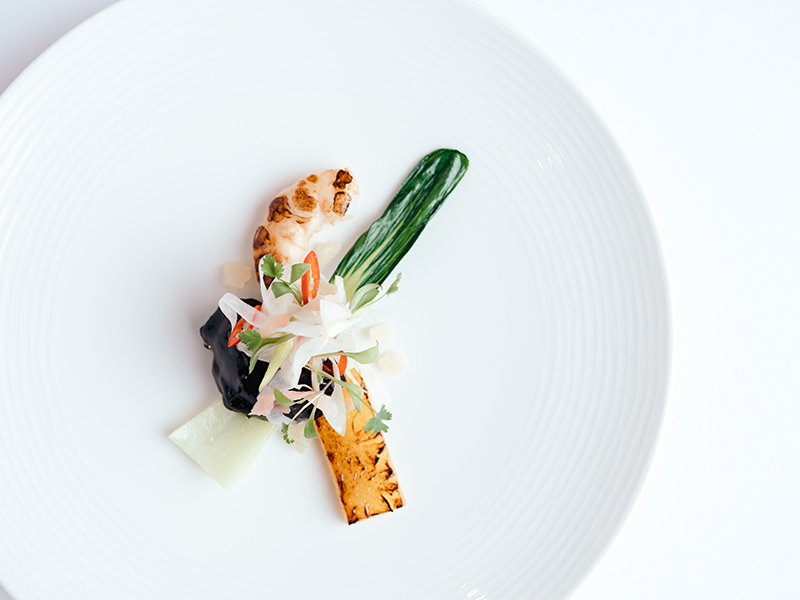 The Atlantic Hotel is one of Jersey’s finest luxury hotels which combines breathtaking ocean views with an award-winning restaurant, situated on one of the most stunning sites in the Channel Islands. 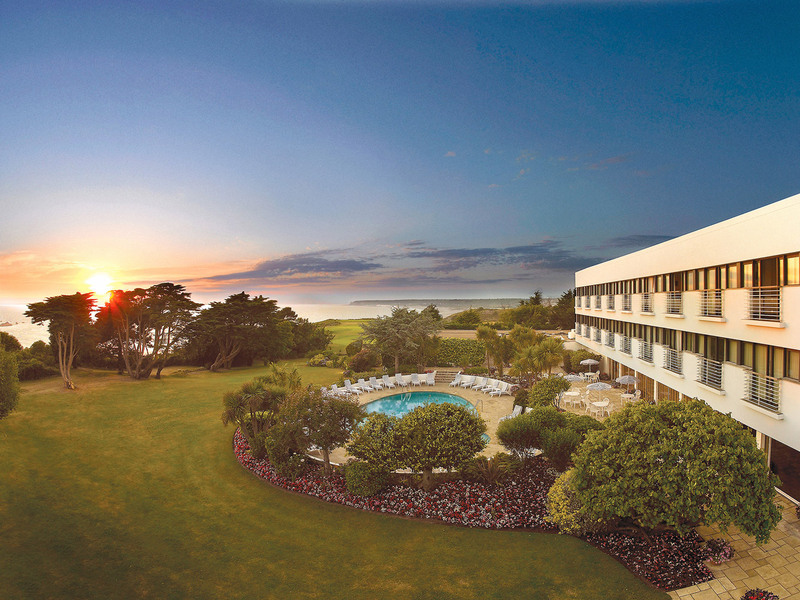 Will has recently been appointed as Executive Chef at this iconic hotel on Jersey. We caught up with Will to talk about island life so far and his plans for the future. Will, you’ve been on Jersey for 6 weeks – how has it been? It’s been really good! The last six months have been a bit of a whirlwind; my last role at Coast was highly seasonal so we had a busy Summer, then I was in the final for National Chef of the Year so spent some time in London, then we moved to Jersey. I hadn’t planned on moving to a small island, it was purely for the job, the opportunity and the new challenge. I have always moved based on the job and I’ve been lucky to have always lived in nice places. 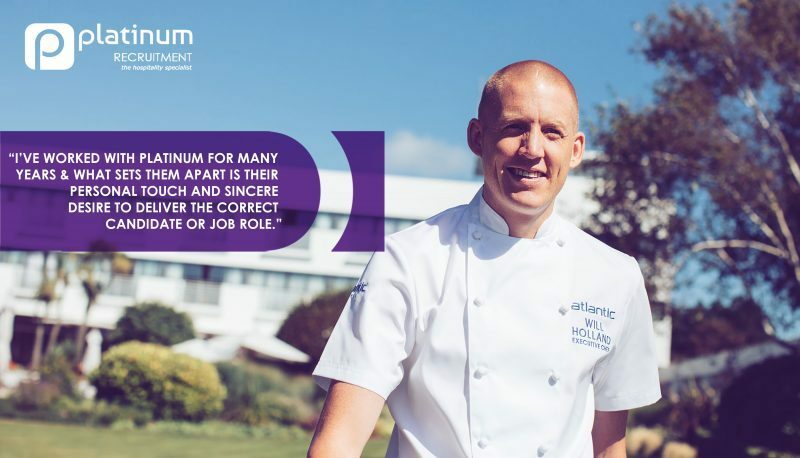 The Executive Chef role at the Atlantic attracted me and so we looked into whether we would like to move our family to Jersey. It was a big move – I’m not a twenty-something chef with whites, knives and a PlayStation. It was a big decision to bring the whole family here, but definitely a good decision. What are the differences in working on a small island compared to the mainland? I was naively concerned about produce but actually the produce here is better than on the mainland. 90% of our suppliers deliver 7 days a week, so we have fresh dairy, vegetables and bakery deliveries every day, including Sunday. We’re really lucky that French produce is absolutely incredible and also delivered to Jersey on a daily basis. The fish is so fresh, in the last few weeks I have got my hands on the best fish I have touched in the last 10 years. Incredible turbot, monkfish, scallops, lobster and live seabass – it was insane! I am enjoying serving dishes that are not overly complicated where I am able to let the ingredients speak for themselves. If we get an amazing piece of fish, we cook it respectfully, using simple garnishes, which is what our customers want. How did you start your career in hospitality? I’m not entirely sure where it came from. My parents are academic, but I have never wanted to do anything else for as long as I can remember. As a family, eating together was an important part of family life. I went to catering college and as soon as I finished college I got myself into a Michelin star kitchen. – I know I don’t look old enough, but I’ve been cooking now for more than 20 years! Your last couple of chef jobs have been in restaurants, how are you adjusting to a hotel? Being a chef at a hotel for me is more diverse and presents a bigger challenge. In a restaurant you cook five lunches and five dinners a week, whereas in a hotel you have more plates to spin. I’m at the point in my career where I want to keep pushing, I don’t want an easy life, so this is a great challenge. For the first ten years of my career in hospitality, I worked in hotels, Gravetye Manor was a key one and I spent five years there. I just love everything to do with luxury in hotels from a dining point of view, it’s not just a great dinner, but also a fantastic breakfast and a stunning afternoon tea. Since I’ve been here, I’ve rewritten the Room Service and Lounge and Terrace menu, adding things like fish finger sandwich to the room service menu, using line caught cod, home-made chips and home-made tartar sauce. The main thing is that it is all important. – We’re welcoming weddings, VIP exclusive use events, buffets, conferences and meetings and events and we want the food to be excellent across the board. Did you always want to work in a high end kitchen? I’m naturally a competitive person so whatever I do I want to do it to the best of my ability. I do a lot of sport and so when I decided to cook as a career, I wanted it to be in the best kitchens. 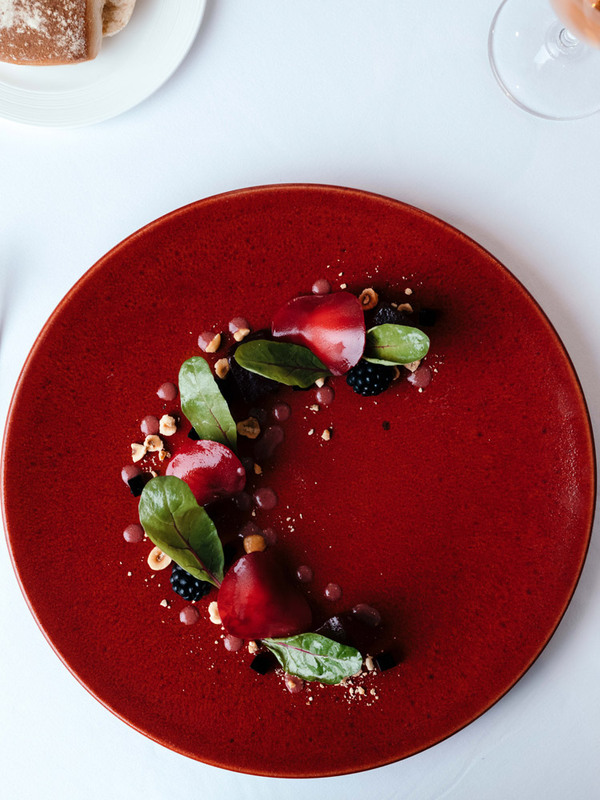 Looking to work in high-end restaurants or hotels? 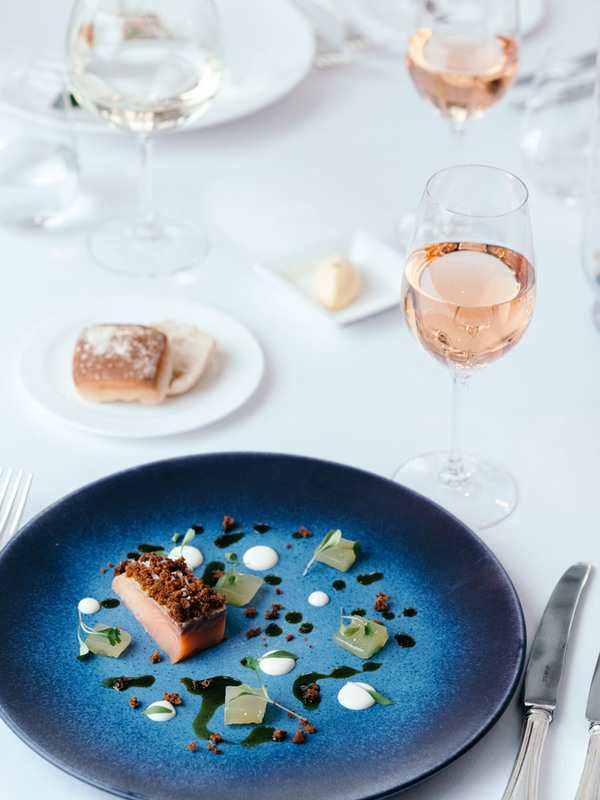 Contact our team of top hospitality recruiters at Platinum Recruitment to find out about our latest hospitality jobs or search our up to date Job board for all the latest vacancies. Has island life opened up any new sporting activities? I love my running, so I have some new scenery on Jersey which is pretty cool, however I have found out that Jersey is very hilly and I live at the bottom of a hill, so there is no such thing as a flat run! The other day I ran along some bays and discovered that I was running along a beach that was sinking sand – it destroyed my legs but was good! I have inherited a great team but I also brought quite a few guys with me. My Sous Chef and I worked together at La Becasse in Ludlow. – He was a CDP at the time and since then he has been at the Samling and the Isle of Eriska. We always talked about working together again and this was perfect timing. It’s great to have some continuity, the chefs that have already worked with me know what to expect and understand my standards. The Atlantic Hotel has been here for 47 years. It’s a family owned and run business with a fantastic reputation for dining. With that in mind, changes need to be gradual and considered. We have loads of ideas and plans and 2018 will be a big year in terms of implementing the change. I won’t give too much away however at the moment we have the Ocean Restaurant which, gastronomically has a great reputation, however, is the only dining option for guests who stay at the hotel. Our guests tend to stay for extended periods so we are looking at diversifying the dining in the hotel. We’ve already introduced the Market Menu which is a daily changing menu that gives guests some extra options but there is more to come! It’s very exciting! Keep up to date with Will and The Atlantic Hotel by following their social media pages below…..
We would like to say a massive thank you to both Will and Patrick for taking the time to talk with us and wish all the team at The Atlantic Hotel very successful 2018!